The French call it “color of mystique” and “fantasy.” The Hanbok, which is Korea’s traditional outfit, has one of the richest, most vibrant colors of all traditional Korean things. The price of a Hanbok varies according to the design and material, type of embroidery, decorations and brand name. The price for a woman’s Hanbok generally begins at \150,000 for both the top and bottom. The price for a man’s Hanbok begins somewhere in the range of \150,000~300,000 including the top, bottom, vest, and coat. Depending on the embroidery and material, the prices vary; the more elaborate the embroidery and fine quality of material, the more the price increases. Children’s Hanbok is popular for its relatively affordable price. Most Hanboks are custom-made for sale. 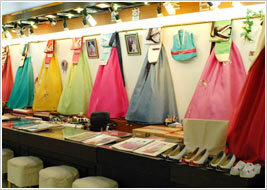 Select your desired colors and material, and measure your size at the Hanbok shop. It takes at least one week to as long as three weeks to make the Hanbok; therefore it is recommended that tourists purchase a ready-made Gaeryang Hanbok. Gaeryang Hanbok is an altered Hanbok so that it may be worn comfortably for daily life. You can find the largest variety of Gaeryang Hanboks in Insadong. 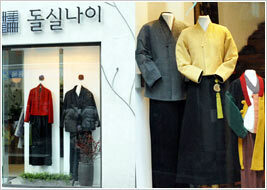 Insadong has numerous Gaeryang Hanbok shops, located all over the area, offering top designs and various types of material. 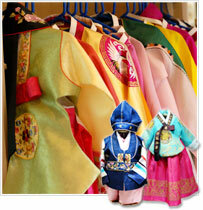 Gaeryang Hanboks are more affordable than traditional Hanboks, and are more convenient to wash and wear. Doosan Tower, located at Seoul Dongdaemun Market, has a marriage-essentials complex on the 7th floor, offering not only Hanboks, but bedding, decorative ornaments, and more. You can also take care of your shopping for trendy fashion-wear all at Doosan Tower. Business hours begin at 10am and end at 2am, so it allows you to shop late at night if you are busy during the day. Take Subway Line #2, 4, or 5 to Dongdaemun Stadium Station, and go out of Exit #14. Walk toward Dongdaemun for about 200m; located to the left of Doosan Tower. Gwangjang Market is well known for its long tradition and history in the Hanbok-making business, and as it is a traditional type of market, it might not be the most convenient place to shop, but you can get the best deals Seoul has to offer in terms of Hanboks. You can also see what a traditional Korean market is like, and have fun bargaining for items you want to buy. About 600 Hanbok shops line the first and second floors, with a wide range of prices depending on the material, embroidery and design. If you are looking for the best deal, then Gwangjang Market is the place for you. Each shop has its own business hours, but most shops usually open sometime between 6~8am and close somewhere around 7pm. All shops are closed on Sundays. Take Seoul Subway Line #1 to Jongno 5-ga Station and go out of Exit #8; it’s a 2 to 3-minute walk from the station exit. If you feel purchasing a Hanbok is too costly, you can consider taking home Hanbok-related souvenirs such as a miniature Hanbok. The Tourist Souvenir Shop next to Insadong’s Tourist Information Center has many such items. There are two types of miniature Hanbok articles. One is a framed miniature Hanbok, and the other is a doll wearing a Hanbok. These miniature Hanbok items come in all types of Hanbok including royal court Hanboks, Daejanggeum (Korean drama, Jewel in the Palace) -type Hanboks, and ceremonial Hanboks. Also, the dolls in Hanbok range from moderate to top quality high-priced dolls for doll-collectors. The Tourist Information Center at Insadong is located about 30m from the Insadong entrance, and the Tourist Souvenir Shop offers works by the Hanbok-miniature artist, Lee Seung Ok. The Insadong entrance begins at Jongno, and the Insa Korea Shop situated near the entrance offers affordable Hanbok miniature dolls. You can purchase framed miniature Hanboks at the Tourist Souvenir Shop located at the crossroads of Insadong. Products by Lee Seung Ok begin at ￦120,000, and can exceed ￦300,000 depending on the size and Hanbok-type.